Automatic case erector/case former can complete the process of carton erecting, vertical forming, bottom flaps folding and bottom tape sealing automatically according to programs. Established in 1989, Hualian Machinery Group Company is an experienced automatic case erector manufacturer and supplier in China. 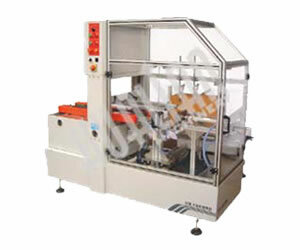 In addition to automatic case erectors, we also offer vacuum sealers, air extractor packaging machines, vacuum packaging machines, band sealers, carton sealers, strapping machines, etc. Our packaging machines have the characteristics of high production efficiency, good packaging quality, and reliable performance. They are extensively used in chemical industry, food industry, textile industry, pharmaceutical industry and other industries. We have obtained ISO9001:2000 certification and our automatic case erectors and other packaging machines are all CE certified, so you can feel secure in using them. Furthermore, we are located in Wenzhou City in Zhejiang Province. This enables us to deliver your goods by sea, by air or by land. Please contact us if you want to get more information about our automatic case erectors.